Swimming in turquoise waters teeming with sea life, a hike through dense forest discovering old ruins covered in blossoms, the breathtaking views of a myriad of lush islands surrounded by the sea, warm and gracious people....welcome to St. John. The smallest of the Virgins is spectacularly packed with awesome beaches, incredible natural bays and quaint but international flavor. The St. John Destination BraceletTM is a tribute in precious metals to all of the special qualities that make St. John such a paradise. 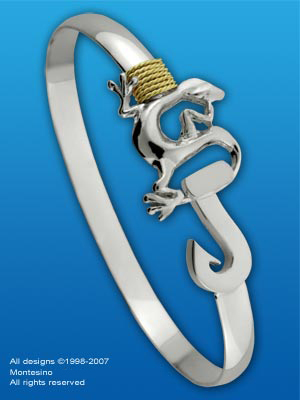 The stylized "St" is clasped by a "J" reminiscent of ancient Taino fishhooks and symbolizes the "Hook" that this magical island has on your heart. The 3 strand 14 karat gold wrap is wound 7 times to represent the 21 square miles of wonder that is at every turn. If you would like to be the exclusive retailer of this beautiful bracelet in your area, please call us at 954-767-6185.